Dickens County, Texas was home to several large and well known ranches including the Spur, Pitchfork, SMS, and Matador Ranch in the late 1800's. The photos displayed above are from ranches in Dickens County in 1939 captured by the Farm Security Administration (FSA). High quality historical photos are hard to find. 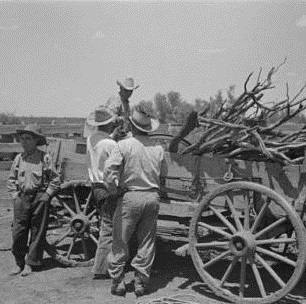 Historical Findings just released a large collection of ranch life photos taken by the FSA. The photos in the collection depict early life on ranches across the country. You can view images of early ranch life in Texas in their Texas Ranch Collection on eBay. The collection has over 100 old photos from ranches across Texas. These are great old prints from the Walking X , the SMS, the King Ranch and many smaller ranches. Some are identified only by the town or county. There really are some rare treasures here available for viewing or purchase.